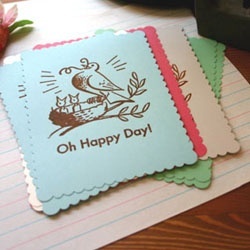 Description: Be the early bird and bring home the worm with these hand silkscreened notecards. Vintage colors and scalloped edging make for sneaky peeky into the past. Blank back allows you to jot down the sweetest of thoughts for that special, special someone in your life.